Ramada Thompson: The chafing dish is not yours. Kent Gregory: Yes, it is. Ramada Thompson: No, it isn't. Kent Gregory: OK, I don't want it. Ramada Thompson: Just take it. Topper Harley: I'll take it. Ramada Thompson: You stay out of it. Q: What are the differences between the British PG version and the Uncut Version? I watched this movie after watching a really poorly made one, so this film came off like Citizen Kane in many respects. After not watching this film for such a long time, I came into this viewing wit ha more trained eye, and to say the least, it was as good then as it is now. This is easily one of those parody movies that will live forever, especially due to all of the great scenes on the aircraft carriers (dogs chasing the plane, the dancing, etc.). While the film did have its dull moments, there were too many funny moments. 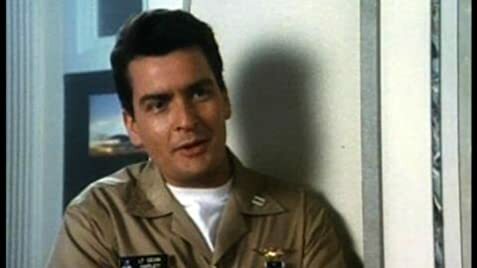 Charlie Sheen seemed perfect for this role, simply because it looked like he tackled this movie with a serious purpose. Cary Elwes was also good, considering the stuffy Brit took on the whole comedy role quite well. Kudos to all who had a hand in this film.